﻿ Makara Bungalows, Sihanoukville | FROM $41 - SAVE ON AGODA! "Two minute walk to beach!" Have a question for Makara Bungalows? "Friendly staff, nice swimming pool, well located." "The room is very clean and comfortable." Nestled in the heart of Ochheuteal Beach and Serendipity Beach, Makara Bungalows is an ideal spot from which to discover Sihanoukville. The hotel provides accessibility to important town facilities. For sightseeing options and local attractions, one need not look far as the hotel enjoys close proximity to Occheuteal Beach, Serendipity Beach, and Scuba Nation Diving Center. Makara Bungalows also offers many facilities to enrich your stay in Sihanoukville. Guests can enjoy on-site features like a car park, Wi-Fi in public areas, concierge, tours, and room service. Experience high quality room facilities, including a shower, television, Internet access, complimentary bottled water, and air conditioning, to help you recharge after a long day. Recreational facilities available at the hotel include an outdoor pool and garden. When you are looking for comfortable and convenient accommodations in Sihanoukville, make Makara Bungalows your home away from home. "This is the best hotel we stayed during the trip." On the map, it looks perfect: right in the middle of Ochheuteal Beach. The trouble is, the beach is quite long and there is not a lot happening in the middle part. You’re looking at a 15-20 minute walk every time you head into the main entertainment zone. The area around the hotel is dead at night and there is nowhere to buy a coffee in the morning. Aside from all that, the room itself is absolutely fine and you’re genuinely poolside, which is great. The beach is only a 2-3 minute walk away. This hotel would be perfect for some but overall, we were put off by the location. great value for bungaloe, but every cup of coffee in restaurant is $.90 for small cups .for breakfast i need 3-4 cups this is way too much$ also chairs in restaurant are all wood and very very hard not comfortable, need cushions!!! 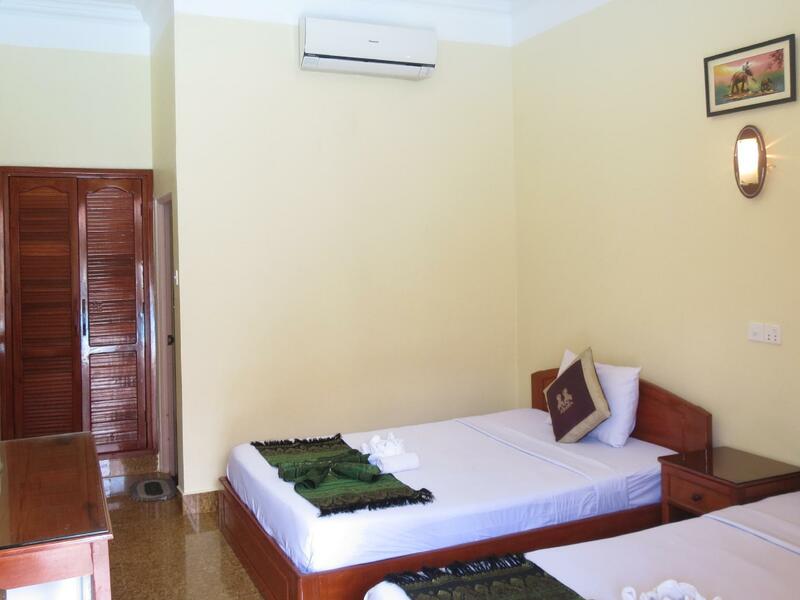 staff are great rooms are clean pool is well cared for and not super cold as many in cambodia and thai are, food is good here, beds are very comfortable and well maintained old ones are thrown out.just simply a great value AAAAA. two minute walk to beach! Stayed for two nights, had a great room by the pool. Really clean and staff were great. Location was ideal, just set back from beach at the quite end away from music, but could walk to the night life in 5min. Loved this place and would return again and recommend. What you get for the price is amazing! Booked for 2 days and then extended to 4 days. This was a great little hotel. Quiet and relaxing. The room was clean and functional. Nice pool, very clean, good size, about 15 metres. Very close to southern end of Ochheuteal Beach, 1-2 mins. walk. Motorbike rental very reasonable. Good food. The staff were great, friendly and helpful. We would definitely stay here again. The hotel was very nice. It was clean. We arrived exhausted after taking an all night bus. They let us check in very early. Also, I got a fish on a snorkeling trip and they cleaned it, cooked it and served it to us free of charge. Great staff! The pool was great. The rooms have fridges but not hot water pot. The location is only one or two minutes from the beach. It's quite a hike to get to the central part of town, but you can rent a scooter or bike for cheap. sheets were just rotated when they cleaned. musty mildew smell in bathroom. pool side rooms can be very loud from 8am to 8pm. restaurant is worth skipping, since many amazing places in the town. man at front desk was terrible/rude. lady was extremely kind. We had a very pleasant stay for three nights. We found the place so relaxing, as we spent our time wandering to the nearby beach, or sitting in the nice restaurant, surrounded by lush plants and smiling staff. It was a long walk back from the Serendipity area in the evening, but a tuk tuk only cost $2. Had a lovely week at the hotel. Great location. Walking distance from the beach but away from the noise. Nice pool and great idea to have an open air dinning room. Staff we're helpful and friendly. Rooms a bit small for a couple but ok for a single traveller. They rented out scooters at a reasonable price so getting around was ok. This may be the last little guesthouse as you approach Otres from Occhateal Beach, but its "remoteness" increases its charm! The environment is much quieter than hotels closer to Serendipity Beach! My stay was perfect. I practiced music every morning, enjoyed a lovely shower, had a filling and reasonbly priced breakfast with delicious Khmer coffee, could walk to areas of interest, and end days with a relaxing swim at the pool! The whole guesthouse is compact, but very functional. All the rooms are either situated around a perfectly sized swimming pool or around the back of this courtyard type set up. Rooms in the back allow for slightly more privacy. The owner, Mr. Kim is very friendly and helpful as are all the staff. You can also rent basic bicycles and motorcycles here if you wish to vary your adventures from those that require a walking speed. Each room includes a refrigerator, where you can store your bottles of wine and snacks, and a safe box...good for peace of mind should you want to go hop on a dive boat for a day or two or go hiking to other beaches or, in my case a local microbrewery. A one minute walk to the beach takes you the edge of the more commercial Occhateal beach with its many shore side Khmer restaurants. From here you can either walk down to Party at Serendipity, catch live music at the Led zephyr, or walk to the more backpackerish Otres beach with its laid back restaurants and bungalows. 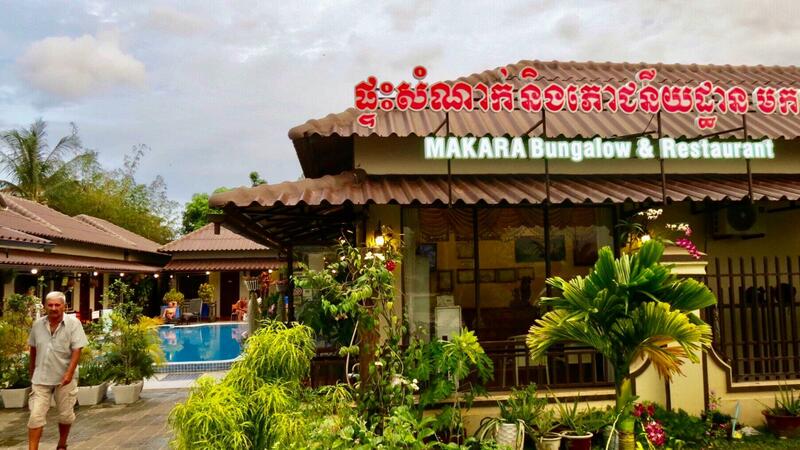 I was never disappointed with my days and nights in Sihanoukville because of this bungalow - even on the two days I did not set foot outside Makara! My stay was very pleasant in a big room for fair money. The staff very friendly and competent, good skill of English. Restaurant serve good food and Hotel/Resort is located few step from the beach. Little bit far from the center but this not disturb, you can rent for fair price motorbike or take taxi/Tuk Tuk in front of Hotel/Resort. Sure if I go back to SV I stay again there. We paid USD25 for a twin room. But, we got 2 double beds, so only used 1 of them. The room was, clean (serviced daily), good aircon, wifi in room, fridge, and a little balcony facing the pool.The shower had low pressure, but good hot water. The best part was the lovely clean pool. Sihanoukville beach is crowded with deck chair all the way to the waters edge and the water isn't very clean. Otres beach which is extolled as the better beach was full of floating rubbish(mainly lotus reeds, but also plastic bags, bottles, and styrofoam). Both were too dirty for me to have a swim in the ocean. So, it was really nice to have a lovely clean pool to cool off in after a day out. The location is 1 minute walk to the ocean and beach bars for a sunset drink, but at the end of the tourist strip, so quiet for sleeping. I really liked our 5 nights at Makara Bungalows, and would definitely recommend it. In my opinion it is a much better place to stay than Otres Beach, and the best value for money on Occhteal Beach. A nice quiet hotel near beach but fare from entertainment. you need tuktuk or your own bike to be mobile. clean rooms, good food, very helpful staffs. Only two deckchairs around the pool but you can sit in front of your room just one meter far from pool. I can recommend. Guest house is 2-3 minutes walk from beach. There is good restaurant for breakfast and dinner. Room is OK, but the is a little bit noise from other guests and staff (singing cleaner in the morning). I asked hotel two times about some details to the transport from airport - in the end it was easy (shuttle buss after arrival which stop in front of hotel - 6 USD, but they don´t send me this simple information). Really enjoyed our stay here. The staff were very helpful and friendly. Helped with visa application and allowed us to store luggage when we travelled to Koh Rong. Really nice pool. Restaurant not that great though but the hotel is really close to the beach so easy to get to better restaurants. Quiet, nice clean room, friendly staff. Good value, staff very friendly and attentive. Good WiFi, good quality food. This is the best hotel we stayed during the trip. The room is very clean and comfortable. Every room has the pool view. The only thing that I don't like was the location is a little bit far from the harbour so we have to take the tuk tuk all the time.